I darted all over the National Zoo this past Saturday for its "Enrichment Day," giving my new Sony FE 100-400 GM telephoto lens a workout. I've posted about a cheetah, and now I'm featuring a gorilla. I'm not sure what the zoo did with the gorillas in its charge for their enrichment; I didn't see anything obvious. But unlike my visit to the zoo the previous weekend, I did see a couple gorillas ambling around their outside enclosure. As I watched the gorillas, I thought of how much like human beings gorillas are. And while contemplating that, I wondered as I often have about the morality of zoos. 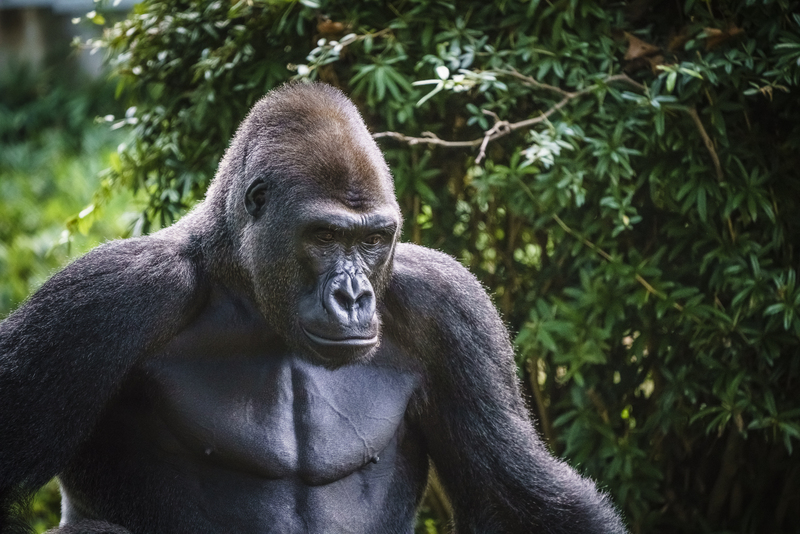 We share perhaps 98 percent of our genetic code with gorillas, yet for our own amusement, we confine them--not to mention other thinking and feeling animals such as cats, bears, and even ravens--to areas far smaller than their native ranges. How is it ethical to treat sentient life-forms this way? The question delves into a complicated philosophical thicket. I do think it's unequivocal that we cannot morally seize animals from their native habitats, and then keep them in what are essentially prisons, for our own entertainment. That's not the complicated part. Nevertheless, if zoo animals aren't happy, it's hard to see how we could justify continuing to breed them. In the previously linked article, famed primatologist Frans de Waal describes apes as "enriched and entertained" in modern zoos. In contrast, another article, "Zoos Are Too Small for Some Species," showcases the potential challenges faced by large predators when confined to enclosures that are minuscule compared to where their species evolved. Ultimately, I'm not sure about the ethics of zoos. My goal certainly isn't a definitive treatise on the subject, an endeavor for which the light web browsing I've done on the subject would not prepare me. I just want to post pictures while sharing my thoughts about them! And I can't help but ruminate on this topic when visiting the zoo and processing my pictures from there.